Little Beaver’s Hydraulic Earth Drill is a dependable, easy to operate solution for multiple digging and drilling applications including fence and sign installation, landscaping and soil sampling. 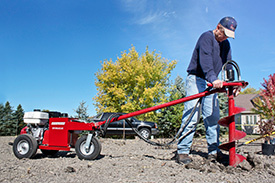 The drill’s compact design allows access to areas that skid steer-mounted augers cannot reach. Its 11-hp engine and convenient hydraulic set-up allow for efficient digging in the toughest soil. The drill is capable of 30-foot depths with a 12-in. -or-smaller diameter auger and at 150 rpm, provides enough torque to operate augers up to 16-in. Little Beaver’s exclusive steel torque tube protects the operator from dangerous kickback allowing for one-person operation.